In today’s eco-conscious climate the demand for environmental solutions is more important than ever, not only for consumers but manufacturers, operators and distributors. A recent Mintel study on consumer trends has highlighted sustainable packaging as an important driver for food manufacturers. The research firm said recycling campaigns and government bans are turning consumer focus towards green alternatives. Mintel research also revealed that 72 per cent would be interested in buying products made with recycled plastic and 79 per cent believed people should be incentivised to recycle plastic. Our supplier Dart Products Europe have launched the rPET DeliLite®, which is a range of high quality, lightweight and economical containers and lids, that offer a firm lid fit, reducing the risk of spills and leakages, helping to keep the contents fresh. 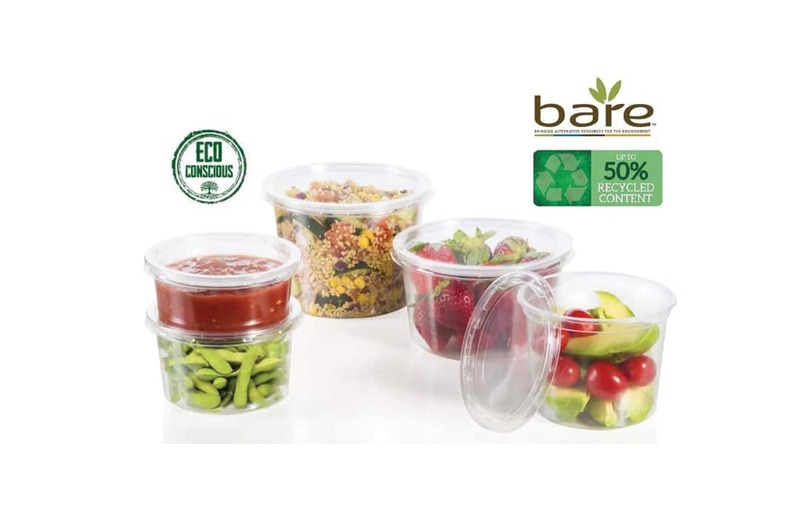 rPET DeliLite® is part of the Bare® by Solo® range of sustainable single-use foodservice products that uses a variety of materials to provide sustainable solutions. rPET DeliLite® pots and lids are crack resistant and oil resistant, and so are suitable for a wide variety of dressed foods. They also have crystal clear clarity which makes them perfect for presenting salads, prepared fruit and deli produce such as olives, pasta dishes and coleslaws. rPET DeliLite® can be used for cold and ambient food applications, such as pasta salads, couscous, nuts and fruit and any type of pre-dressed foods up to 55°C. rPET DeliLite® are available in five sizes 217ml, 279ml and 374ml, which are available in combo packs of 500 and 550ml and 700ml, which are available in combo packs of 300. Keep it green by choosing Dart Products Europe’s rPET DeliLite® pots and lids. For more information on rPET DeliLite® from Dart Products Europe, please contact Bunzl Catering Supplies today.